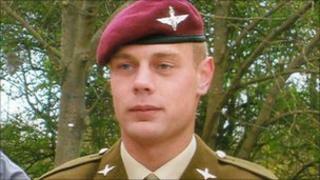 The body of the 350th soldier to be killed in Afghanistan has been repatriated to the UK. Pte Martin Bell, 24, from Bradford was serving with the 2nd Battalion the Parachute Regiment when he died. The Ministry of Defence said he died in an explosion after disobeying a direct order and going to the aid of another wounded soldier in Helmand province. Pte Bell, who died on 25 January, was due to be flown back to RAF Lyneham in Wiltshire at noon. The soldier was hailed as a hero for his bravery by his commanding officer, Lt Col Andrew Harrison. Speaking last week, Lt Col Harrison said: "He knew the risks all too well. "Twice in the minutes before his death he had witnessed at first-hand the devastating human impact of IEDs (improvised explosive devices). "The term 'hero' is overused in contemporary commentary; take a moment to reflect on Pte Martin Bell. "For his exceptional valour he paid the ultimate price." In a statement, his relatives said he was proud to be serving his country. "He had a wicked and infectious sense of humour that would have served him well in difficult times. "He made us all very proud and he will leave behind a hole in all of our hearts that will never be replaced." The MoD said Pte Bell had been deployed to Afghanistan on 14 October and had been due to come home for rest on 14 February. He leaves behind his parents, Simon and Elaine, and brothers Oliver and Philip.